It's been one year since Action Cable debuted at RailsConf 2015, and Sophie DeBenedetto is here to answer the question in the minds of many developers: what is it really like to implement "the highlight of Rails 5"? Sophie is a web developer and an instructor at the Flatiron School. Her first love is Ruby on Rails, although she has developed projects with and written about Rails, Ember and Phoenix. Recent years have seen the rise of "the real-time web." Web apps we use every day rely on real-time features—the sort of features that let you see new posts magically appearing at the top of your feeds without having to lift a finger. 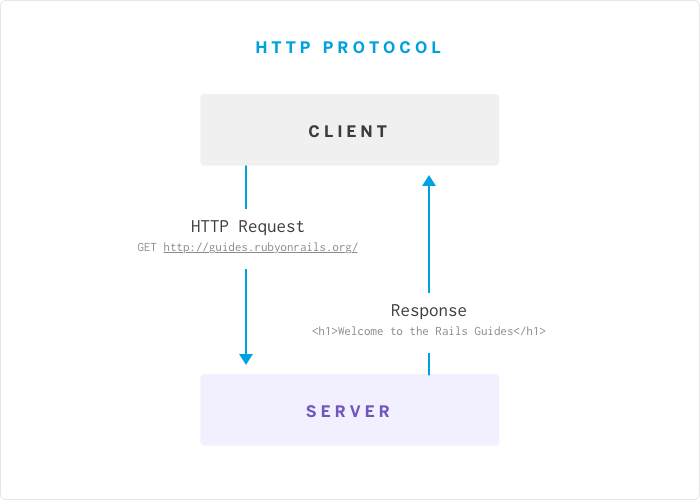 While we may take those features for granted, they represent a significant departure from the HTTP protocol's strict request-response pattern. Real-time web, by contrast, loosely describes a system in which users receive new information from the server as soon as it is available—no request required. WebSockets are a protocol built on top of TCP. They hold the connection to the server open so that the server can send information to the client, even in the absence of a request from the client. 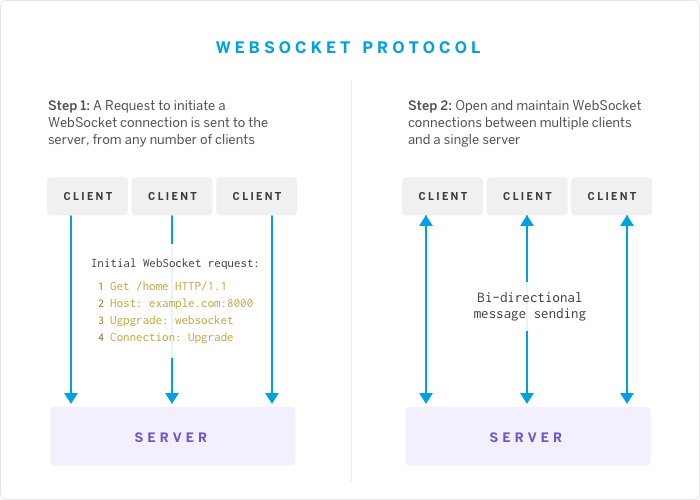 WebSockets allow for bi-directional, "full-duplex" communication between the client and the server by creating a persistent connection between the two. With the development of Action Cable and its recent integration into Rails 5, we now have a full-stack, easy-to-use implementation of WebSockets that follows the Rails design patterns we've come to rely on. The only question is why it took so long. But DHH knew there's something lost without sockets. "If you can make WebSockets even less work than polling, why wouldn't you do it?" Sure, polling met the needs of his team (and many others) for many years. But as more and more consumers and developers began demanding real-time functionality, and as newer frameworks like Phoenix arrived to meet that demand, Rails felt the need to deliver—and in fact, Action Cable draws some inspiration from Phoenix channels. It hasn't been smooth sailing. I've followed the development of Action Cable closely, and before it was merged into Rails 5, I would say that it wasn't easier than polling. But after a year of development, it's very easy to implement, and it aligns nicely with the other design patterns we've become so comfortable with in Rails. So, how does the "highlight" of Rails 5 work, and what's it like to implement? Let's take a closer look! Before we dive into some code, let's take a closer look at how Action Cable opens and maintains the WebSocket connection inside our Rails 5 application. Action Cable can be run on a stand-alone server, or we can configure it to run on its own processes within the main application server. In this post, we'll be taking a look at the second approach. Action Cable uses the Rack socket hijacking API to take over control of connections from the application server. Action Cable then manages connections internally, in a multithreaded manner, layering as many channels as you care to define over that socket connection. For every instance of your application that spins up, an instance of Action Cable is created, using Rack to open and maintain a persistent connection, and using a channel mounted on a sub-URI of your main application to stream from certain areas of your application and broadcast to other areas. Lastly, Action Cable uses Redis as a data store for transient data, syncing content across instances of your application. Now that we have a basic understanding of how Action Cable works, we'll build out a basic chatting application in Rails 5, taking a closer look at how Action Cable behaves along the way. In this example, we'll build a basic chatting application in which users can log in or sign up to create a username, then create a new chat room or choose from an existing chat room and start messaging. We'll use Action Cable to ensure that our chat feature is real-time: any users in a given chat room will see new messages (their own and the messages of other users) appear in the chat, without reloading the page or engaging in any other action to request new content. You can follow along below, check out the code for this project on GitHub, visit my deployment here or, deploy your own copy by clicking this button. At the time of this writing, Rails 5 was in Beta 3. So, to start a new Rails 5 app, we need to do the following. First, make sure you have installed and are using Ruby 2.3.0. You'll also need to have Postgres and Redis installed in order to build this app. You can brew install redis and brew install postgres if you haven't done so already. Now we're ready to generate our new app! Make sure you've un-commented out the Redis gem from your Gemfile, and bundle install. Our domain model is simple: we have users, chat rooms and messages. A chat room will have a topic and it will have many messages. A message will have content, and it will belong to a user and belong to a chatroom. A user will have a username, and will have many messages. The remainder of this tutorial will assume that we have already generated the migrations necessary to create the chat rooms, messages and users table, and that we have already defined our Chatroom, User and Message model to have the relationships described above. Let's take a quick look at our models before we move on. We'll also assume that our routes and controllers are up and running. A user can log in with a username, visit a chat room and create new messages via a form on the chat room's show page. Okay, now that we have our app up and running, let's get those real-time messages working with Action Cable. Before we define our very own Messages Channel and start working directly with Action Cable code, let's take a quick tour of the Action Cable infrastructure that Rails 5 provides for us. Our ApplicationCable module has a Channel and a Connection class defined for us. The Connection class is where we would authorize the incoming connection—for example, establishing a channel to a given user’s inbox, which requires user authorization. We'll leave this class alone, as any user can join any chat room at any time. However, the Messages Channel that we will define shortly will inherit from ApplicationCable::Channel. The Channel class is where we would place shared logic among any additional channels that we will define. We'll only be creating one channel, the Messages Channel, so we'll leave this class alone as well. Okay, let's move on to writing our own Action Cable code. First things first, setting up the instance of the Action Cable server. First, we need to mount the Action Cable server on a sub-URI of our main application. Now, Action Cable will be listening for WebSocket requests on ws://localhost:3000/cable. It will do so by using the Rack socket hijacking API. When our main application is instantiated, an instance of Action Cable will also be created. Action Cable will, per our instructions in the routes.rb file, establish a WebSocket connection on localhost:3000/cable, and begin listening for socket requests on that URI. Now that we've established the socket connection on the server-side, we need to create the client of the WebSocket connection, called the consumer. Notice that the ActionCable.createConsumer function doesn't specify the socket URI, ws://localhost:3000/cable. How does the consumer know where to connect? We'll specify the development and production socket URIs in the appropriate environment files, and pass it through to the consumer via the action_cable_meta_tag. Note: The default Action Cable URI is in fact ws://localhost:3000/cable, so we could have gotten away without configuring the cable url in development. I wanted to expose this configuration for anyone who wants to customize it in the future. So far, we've used Action Cable to create a persistent connection, listening for any WebSocket requests on ws://localhost:3000/cable. This isn't enough to get our real-time messaging feature, however. We need to define a special Messages Channel and instruct the appropriate parts of our application to broadcast to and stream from this channel. Defining a channel with Action Cable is easy. We'll create a file, app/channels/messages_channel. Here we will define our channel to inherit from the ApplicationCable::Channel class that we described earlier on. Our Messages Channel needs only one method for our purposes, the #subscribed method. This method is responsible for subscribing to and streaming messages that are broadcast to this channel. We'll revisit this method in a bit, and discuss how and when it is invoked. First, let's define how and when Action Cable should broadcast new messages to the channel. At what point in time should a new message get broadcast to the Messages Channel? Immediately after it is created and persisted to the database. So, we'll define our broadcasting code within the #create action of the Messages Controller. 'messages', the name of the channel to which we are broadcasting. message, set to the content of the message we just created. user, set to the username of the user who created the message. Note: There is nothing special about the message or user key here. We can structure or label the data we want to send across the channel any way we like. As long as we tell our subscriber (more on that soon) to access that data in accordance with how we structured it here. This isn't a "step", since we don't have to actually do anything (yet). But let's take a moment to look at how Action Cable pairs with Redis. Action Cable uses Redis to send and receive messages over the channel. So, when we told our Action Cable server to #broadcast to 'messages', we were actually saying "send new messages to the 'messages' channel maintained by Redis." 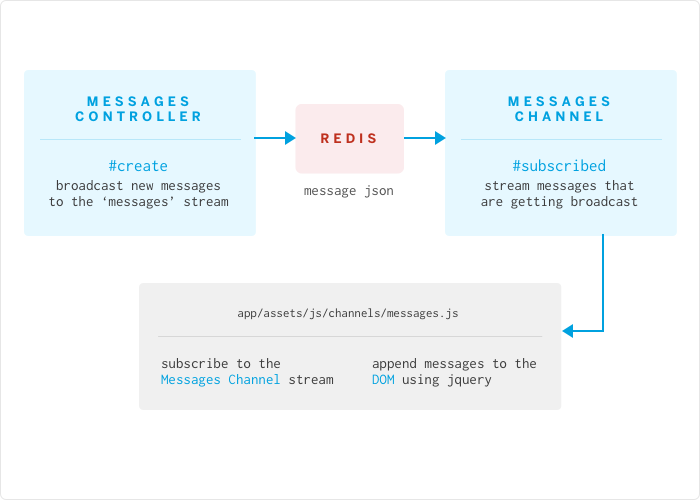 At the same time, the #subscribed method of our Messages Channel is really streaming messages sent over the 'messages' channel maintained by Redis. 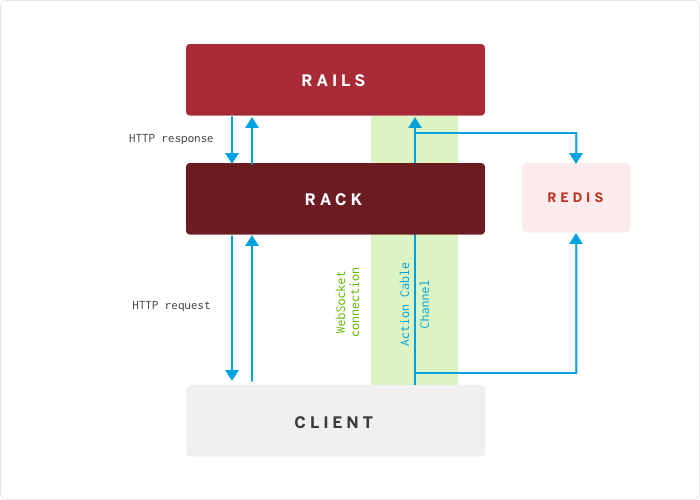 Thus, Redis acts as a data store and ensures that messages will remain in sync across instances of our application. Here, we are specifying an adapter and a URL for each environment. We'll be running Redis on localhost for now. Later, when we discuss deployment, we'll update the production environment's Redis URL. We're almost done! We just need to create a client-side subscriber to our Messages Channel. Our consumer is the client-side end of our persistent WebSocket connection. Now, we need to add a subscription to our consumer, telling it to subscribe to the Messages Channel. We add our new subscription to our consumer with App.cable.subscriptions.create. We give this function an argument of the name of the channel to which we want to subscribe, MessagesChannel. When this subscriptions.create function is invoked, it will invoke the MessagesChannel#subscribed method, which is in fact a callback method. MessagesChannel#subscribed streams from our messages broadcast, sending along any new messages as JSON to the client-side subscription function. Then, the received function is invoked, with an argument of this new message JSON. The received function in turn calls a helper function that we have defined, renderMessage, which simply appends new messages to the DOM, using the $("#messages") jQuery selector, which can be found on the chatroom show page. Now that our real-time messaging feature is up and running, we're ready to deploy! Deploying a Rails 5 app that uses Action Cable is simple. We just need to configure a few things for our production environment. Then, retrieve your Redis To Go URL and update your Action Cable Redis configuration. We need to set the cable server's URI for production. Note: In production, we are using a secure WebSocket connection, wss. Action Cable can only accept WebSocket requests from specified origins. We need to pass those origins to the Action Cable server's configuration as an array. Now we're ready to git push heroku master. Go ahead and migrate your database and you should be good to go. So how does Action Cable stack up to DHH's claims, one year later? So far, we've seen that Action Cable runs seamlessly alongside our main Rails application. Its implementation falls right in line with the design patterns we've become so familiar with. We mount the Action Cable server in the routes.rb file, alongside the rest of our routes. We write the code to broadcast new messages in the #create action of the Messages Controller, and we subscribe to those messages in a channel we define similarly to the manner in which we define Rails controllers. Not only does Action Cable seamlessly integrate with the rest of our Rails application, it provides easy-to-use client-side code, making it a full stack offering. Over all, Action Cable is a very welcome addition to the Rails tool kit. Sophie DeBenedetto is a web developer and an instructor at the Flatiron School. Her first love is Ruby on Rails, although she has developed projects with and written about Rails, Ember and Phoenix. You can learn more about her recent projects by visiting her personal site, checking out her GitHub account, or reading her blog.